Thousands of Kashmiris have allegedly been forcibly disappeared during two decades of conflict in the region, their whereabouts unknown. A police investigation in 2011 by the Jammu and Kashmir State Human Rights Commission (SHRC) found 2,730 bodies dumped into unmarked graves at 38 sites in north Kashmir. At least 574 were identified as the bodies of local Kashmiris. The government had previously said that the graves held unidentified militants, most of them Pakistanis whose bodies had been handed over to village authorities for burial. Many Kashmiris believe that some graves contain the bodies of victims of enforced disappearances. The government of Jammu and Kashmir has promised an investigation, but the identification and prosecution of perpetrators will require the cooperation of army and federal paramilitary forces. These forces in the past, have resisted fair investigations and prosecutions, claiming immunity under the Armed Forces Special Powers Act (AFSPA) and section 197 of the Criminal Procedure Code. While we all are happy the Free Waqar campaign worked online and after 277 days of illegal detention , waqar was released but Waqar’s case is representative of the youth who are detained under the garb of PSA to suppress the genuine voice of the people of Kashmir.His release does not signify an end to the campaign but is a part of the continuum of the long and relentless struggle against the illegal detention of many kashmiri youths under the garb of draconian laws . Just after Waqar was released a, teenager Mushtaq Saleem Beigh has been detained without trial in Jammu & Kashmir, northern India, following a grenade attack on the town police station on 19 May. Mushtaq Saleem Beigh’s family claims that he is 17 years old, but does not have any proof of his age. They say they are trying to get proof from his school records. According to the family, he stopped going to school a few years ago, and has since been working as a mason to support his family. According to Mushtaq Saleem Beigh’s family, the state police’s Special Operations Group (SOG) took him and his uncle to an SOG camp for interrogation following a grenade attack on 19 May on a local police station in Sopore town, Jammu & Kashmir, in which nine people were injured. They released his uncle the next morning, but held Mushtaq Saleem Beigh for 12 days. They later moved him to Sopore police station where he was detained for a further 15 days. He was later produced in a local court and transferred to Baramulla sub-jail. On 2 June, police announced that Mushtaq Saleem Beigh, along with Ishfaq Shafi Kana, another resident of Sopore, were arrested for their alleged involvement in the grenade attack. However, Mushtaq Saleem Beigh’s family has not been allowed to see the first information report or formal charge-sheet. Fearing that he may have been detained illegally, on 28 June, the family entered a petition in the Sopore court seeking his release on bail. Following this, the court ordered the police to file a report stating the reasons for his arrest. However, no such report has been filed so far. Mushtaq Saleem Beigh’s father, Mushtaq Ahmad Beigh, has said that when he went to Sopore police station and sought documents including a copy of the report, he was detained there for two days and physically assaulted. The family was able to meet with Mushtaq Saleem Beigh at the police station and at the Baramulla sub-jail. They have said that he was tortured at the police station and the SOG camp in an attempt to force him to confess to his involvement in the grenade attack, and hence he was unable to walk when they met him. There are are many such cases, which need proper judicial intervention . 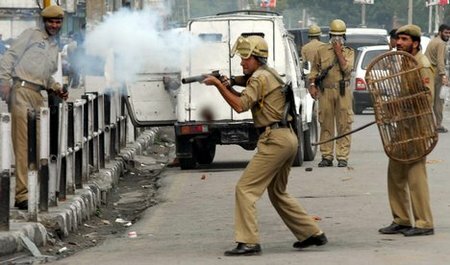 Indian authorities need to stop killing kashmir.